paper askew studio: 2 Sketches 4 You "Rooster Friend"
Here is the card I made using Kazan's sketch from 2 Sketches 4 You. The rooster used to be a pin, but was broken so I got it for free at a garage sale this weekend. SWEET, free is always good and rather than throw it in the trash why not go green and use him on a card. The flowers, eyelets and DP is from Eye-Lets Etc. I made the button out of DP and a 1 inch circle punch. It has about 5 layers of card stock glued layer by layer behind it to make it about as thick as a button. This way I was able to thread ribbon through it without tearing the paper. The white border I made with white card stock punching a row of 3/4" circles and then 1/2" circles. I tried to make it look like chicken wire, maybe silver CS would look a little better??? I don't know, maybe its ok?? I used my Sakura white and gray souffle pens to do faux stitching and as the edging around the piece that says friend. LOVE my souffle pens! WHAT A SUPER SWEET CARD PAM! LOVE THE BORDER PAPER YOU DID WITH THE CIRCLE PUNCH, I WAS JUST GOING TO SAY WHAT GORGEOUS POLKA DOTTED PAPER: GENIUS! LOVE IT!! HAVE YOU GOT A NEW CAMERA RECENTLY? I'VE BEEN NOTICING YOUR PHOTOS ARE AMAZING!! This is so adorable!!!! I love it! What a awesome card. I saw that it was looked like chicken coop wire, cool idea! Way to go green! What an adorable card! I would have NEVER thought to use a broken pin! You are so creative!!! Great card, love the pin as the focal point!!! SUPER CUTE card Pam!! LOVE everything about it!! Thanks for your sweet comment on my card as well!! wow Love that! and love that you used that rooster pin. I have a box of pins and jewlery I have collected for my things and never you use it. I think I might now! Look at you using garage sale broken freebies to make a fabulous sketch card ... love your paper button too ... another great idea I may have to borrow. This came out really cute! Love it! Super card girlie! Love the rooster...that is adorable...good for you for going green to! Great card! I love your interpretation of this sketch. It has a very rustic feel to it. Love the rooster! wonderful card love it ! What a fun card...great colors! This is fab - makes me smile! I love your rooster card! It's s cool! 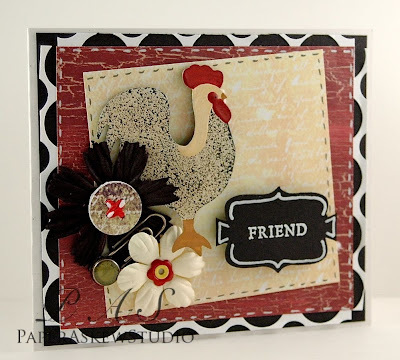 This is fabulous Pam...I am loving the rooster!! Great job with the week 2 sketch!